A Canadian research Institute has listed Rwanda among top countries where migrants feel at home more than anywhere else. 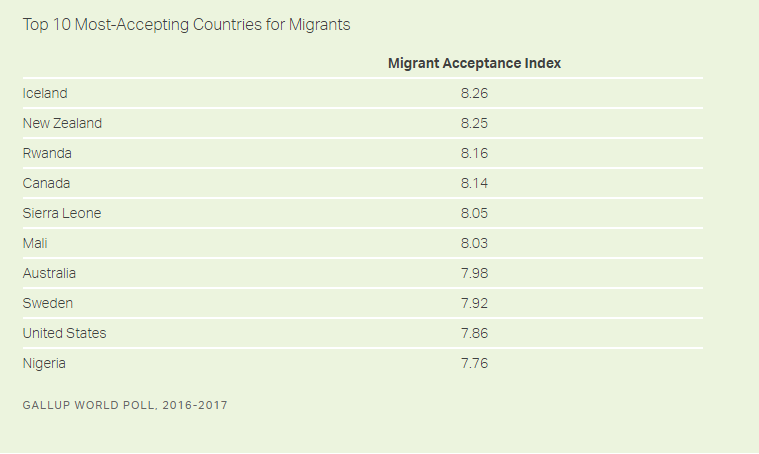 Gallup Migrant Acceptance Index (MAI) ranked Rwanda on the third position among 140 countries in terms of accepting migrants and welcoming/integrating them into the host society. According to the MAI, the ranking is based on extensive research started in 2016 and finalized last year in Canada and United States of America. The research criteria rotated on three major questions that were asked in all the 140 countries. Gallup asks whether people think migrants living in their country is a good thing or bad thing and asks what the natives of respective countries think about migrants becoming their neighbors. The other question in the survey intends to find out whether inter-marriage between migrants and natives is a good thing or bad thing. According to Gallup MAI website “A good thing” response was worth three points in the index calculation while responses like it depends or I don’t know were worth one point, and “a bad thing” is worth zero points. The higher the score, the more migrant friendly country according to the index calculations. Gallup MAI is a Canadian company that was developed and designed to gauge people’s personal acceptance of migrants not just in Europe, but throughout the rest of the world. According to the rankings by MAI Iceland came the first with the score index of 8.26 while the second is New Zealand with score of 8.25 and Rwanda 3rd scoring 8.16. The total score index by Gallup Migrant Acceptance index is 9.0. Other African countries seen on the top ten list is Mali on the 6th position and Nigeria 10th. In the same sense, Rwanda leads the African continent followed by Mali with score index of 8.03 while Nigeria that scored 7.76 comes third. MAI conducted the survey based on telephone and face-to-face interviews with approximately 1000 people above the age of 15 years. Meanwhile some of the least migrant friendly countries shown on the list of 140 countries include; Macedonia, Montenegro Hungary and others. Rwanda has welcomed approximately 200,000 migrants including refugees from neighboring countries like Burundi and DR Congo. Other migrants come from across the world for business or work purposes. In our previous stories the government of Rwanda indicated its firm position to host migrants who are in need of shelter whenever international laws are observed. “As a matter of practice and policy, Rwanda’s position on migrants and refugees has been to open its doors to any African in need of shelter,” reads a communique from the Ministry of Foreign Affairs in February.